Within a decade or two we will need criteria to determine if an artificial intelligence has achieved consciousness. (I take consciousness without consciousness of self to be impossible). The criteria will have to be consistent and applicable both to life forms and to non-living entities. Within a few more decades, and certainly within one hundred years I think, we will need to be able to determine if an autonomous, intelligent, conscious entity meets the requirements for person-hood. At the same time it will become necessary to create criteria for judging what constitutes a person and what is meant by “mankind” (or person-kind). an abstract vision of those who exhibit some ideal behaviour. My own view is that it is behaviour which determines. To look like a human or to have the physical form of a human is not enough. It is the exhibition of “human behaviour” which determines who qualifies to be a human. “Mankind” or “humanity” or “personkind” then consists of those who exhibit or have exhibited and met some standard of human behaviour. It also follows that any intelligent, autonomous, conscious creature or entity which exhibits these qualifying standards of behaviour is then a member of “mankind” (or of person-kind if language needs a new word). Genetics would then be involved only insofar as genetics determines behaviour. “Human rights” as used today is a false concept precisely because it is divorced from behaviour. It is ethically and logically unsupportable. It is focused on the physical form of “being human” and not on the behaviour which makes a human. As used today, “human rights” is about form rather than substance, and about sanctimony rather than reality. When being a person is defined in terms of behaviour it then follows, naturally, logically and inevitably, that privileges for a person are also determined by behaviour. It would then be perfectly logical to consider the privileges of personhood to be enjoyed by every entity qualifying as a person. And then it would not be necessary to consider privileges for members of IS or MS13 or Anders Behring Breivik or for an Adolf Hitler when he next appears. “That is not who we are” – Barack Obama. Oh Yes it is! But of course it is “who we are”. Certainly admitting a self-judged, wrong-doing – after the event – is also part of “who we are”. But the fact of the wrong-doing remains part of the behaviour which constitutes “who we are”. It does not vanish with a subsequent apology. Torture is wrong but permitted, as a last resort, in special circumstances and must be apologised for if later revealed. The map of all the countries who were complicit – actively or passively – with CIA’s torture program includes most of the countries who speak loudest and most sanctimoniously about human rights. Add to this all the other countries (Russia, China, India, South American countries, …. ) who also use torture in some form, and I come to the conclusion that there is not a single country today where some form of torture (physical as well as mental) is not at least tolerated under some specific conditions. Nobody claims that torture is a “good thing”, but every country also accepts that it can be justified. The concept of “absolute human rights” is fundamentally flawed. The “human rights” that any society is prepared to bestow upon those within or without that society is dynamic and variable. Currently “what humans are”, all around the world, includes the use of torture – knowing that it is “wrong” – under certain conditions when deemed absolutely necessary. There are no absolute values either, just as there are no absolute human rights. How should we judge the behaviour of an ISIS executioner with that of a CIA torturer? An ISIS executioner carries out his bloody beheadings in the belief that he is doing “right” in accordance with his values. A CIA torturer carries out his miserable activities knowing that it is “wrong” but that it is in a “good” cause and justified by his values. I suppose they will both be gathered to the bosoms of their angry gods in their respective heavens. This is the second part of series of posts describing what I call the Engagement Theory of Motivation and which I have found useful during my working career. The space within which rational behavior can be expected and elicited is constrained by the debilitations of intolerable deficiencies on the one hand and needs which are satiated and incapable of providing further satisfaction on the other. Eliciting desired behaviour lies at the core of all human social interaction. I take “manipulation” and therefore motivation merely to be tools for eliciting behaviour from our fellows. As tools they are neutral and neither good nor bad. Since Maslov (1954) first came up with his hierarchy of needs there have been many theories and hypotheses of motivation proposed. I find his hierarchy is fundamentally sound. His approach is still the simplest, most practically applicable approach. It remains I think the most useful – if qualitative – way of addressing motivation and behaviour in the work place. 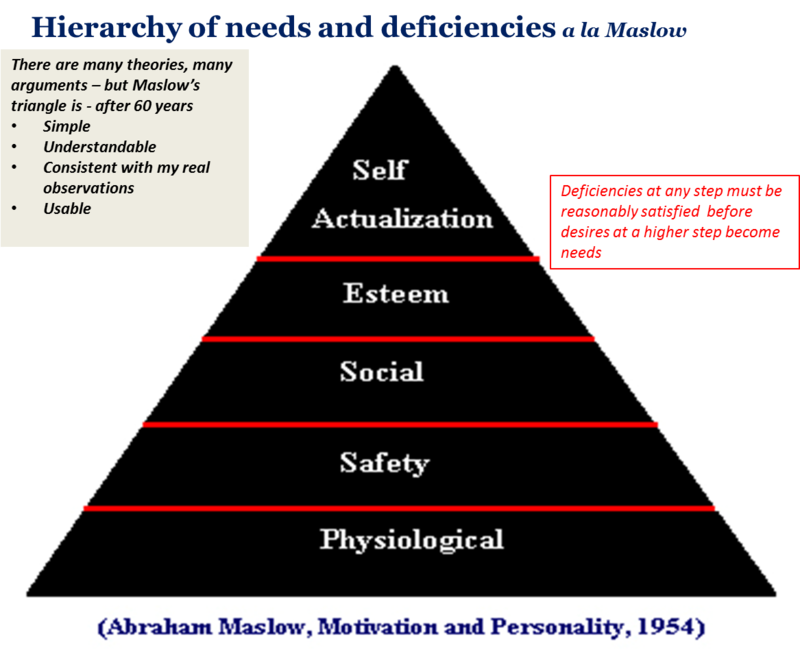 I take Maslow’s lower-order needs (physiological and safety needs) to be mainly – but not exclusively – physical and his higher-order needs (social, esteem and self-actualisation desires) to be mainly – but not exclusively – cognitive. The space for eliciting rational human behaviour lies in the planes of his satisfactions and dissatisfactions. I postulate that all conscious, rational human behaviour is aimed at decreasing internally perceived deficiencies giving dissatisfactions or increasing internally perceived desires (needs) giving satisfactions. I take these planes to be that on which the “state of human condition”, at any given time, can be plotted as a representation of the individual’s satisfactions and dissatisfactions at a particular time. The axis of time is not explicit but it is implied since only one “state of human condition” exists at any given time. For an individual to go from state 1 to state 2 on the behavioural therefore implies – and requires – the passage of time. Vultures, it seems, weigh up the probability of prey mortality before selecting the prey they will follow. But is this innate sense of statistical probability inherent in their genes or is it just a behaviour taught from one generation to the next? I suspect it is a learned behavioural pattern which is reinforced by success and which would be given up if it failed. Just habit then and probably not a genetic knowledge of ststistical probability. Science News: … if you’re a vulture, following a bunch of fat and happy wildebeest probably means you’re going to go hungry. These carrion-eating birds usually follow the wildebeest herd only during the dry season, when there’s more likely to be dead animals along the migration trail, reports Corinne Kendall of Princeton University and her colleagues in a study published January 8 in PLOS ONE. Kendall and her colleagues kitted out 39 vultures (15 Ruppell’s vultures, 12 white-backed vultures and 12 lappet-faced vultures) from the Masai Mara National Reserve in Kenya with GPS transmitters and tracked them for months as the birds flew across East Africa. The three bird species each had slightly different patterns of flight — with similar lifestyles, they have to figure out how to not get in each other’s way — but they all showed a preference for visiting the wildebeest herds in Kenya in the dry season, July to October. That suggests that the vultures take into consideration not only their potential prey’s location but also how likely it is that the prey will die and provide the vultures with a meal. These birds are specialized for eating dead things, after all. Because low rainfall should result in less food for wildebeest and more wildebeest deaths, the best time to find dead wildebeest is during the dry season. During other times of the year, the vultures took different paths to finding meals. Some went to areas outside the migratory paths, probably trying to find dead animals among the region’s nonmigratory populations. Some headed for other areas of Kenya, such as the Tsavo National Parks. One Ruppell’s vulture took off for three months to a region in Sudan and Ethiopia where a species of antelope, the white-eared kob, follows its own migratory route. I find that this disclaimer at the end of this study effectively invalidates the method of the study and its results. This project was supported by a Google.org grant from 2012, although Google.org played no role in designing or conducting this study. The results of the study (that more people searched for health issues on Google during the recession) are trivial and – with the best will in the world – of little value except for providing a plug for Google Search and Google Trends. Of course a Google Trend means something but to imply – as this study does – that a Google Trend for selected search items is a rigorous and valid representation of a human behavioural pattern is more than a little fanciful. The group examined Americans’ Google search patterns and discovered that during the recent Great Recession, people searched considerably more frequently for information about health ailments. The kinds of problems indicated by the queries weren’t life threatening, but they could keep someone in the bed a few days, like ulcers, headaches, and back pain. In total, the team found there were more than 200 million excess queries of this kind during the Great Recession than expected. “While it’s impossible to uncover the motives for increased searches, they likely indicate a person being ill, and ill enough to seek out online information or remedies,” Ayers said. The same group previously published a report showing that queries for anxiety and depression also increased substantially during the Great Recession. Without first a study on whether the usage of Google search is actually representative of any part of the population, and whether a trend in such usage permits conclusions regarding the motives for such usage, this study is little more than an advertisement for Google Search and Google Trends. Just as with Facebook surveys and profound conclusions, I am not at all sure that this “study” can even be considered science – let alone good science. It is published – believe it or not – in a journal of preventive medicine, but it has little to do with medicine and more to do with PR and Google’s image. It’s pretty obvious which kitten is going to grow up to be a physicist. It’s only a matter of time and evolution. Will buying “likes” on Facebook and Twitter translate into votes? Perception can be reality. And fake “likes” are being used to generate fake perceptions of popularity and goodness. Whether humans are dumb enough to be taken in by fake perceptions and whether perceptions can be converted into real voters and customers remains to be seen. Facebook makes it harder to create fake accounts yet openly declares: “As of June 30, 2012, we estimate user-misclassiﬁed accounts may have represented approximately 2.4% of our worldwide MAUs and undesirable accounts may have represented approximately 1.5% of our worldwide MAUs. 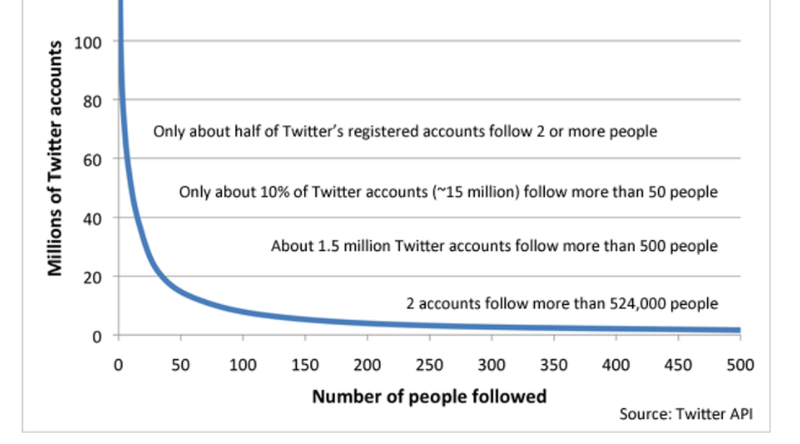 Every account can follow up to 2000 people. By statistically excluding overlapping fake accounts, just on the 12 main marketplaces (Fiverr, SeoClerks, InterTwitter, FanMeNow, LikedSocial, SocialPresence, SocializeUk, ViralMediaBoost), it turns out there are around 20M fake followers on sale right now. Followers are sold at an average price of $18/1000 followers (barracudalabs). Apart from entertainment figures wanting to boost their apparent popularity, the buying of “likes” has now become a routine matter for politicians facing elections. They are relying on the herd mentality to lead to an increase of votes in their favour. The risk they take is that humans – when acting as a mob or a herd – don’t like acknowledging or being accused of acting like dumb animals. But the risk of this backlash is being taken as being small. Politicians in India are now all rushing to buy “likes” – as just another legitimate advertising ploy. They have been paying for favourable articles about themselves and negative articles about their opponents in the print media for many years. But even the most socially illiterate politicians – who wouldn’t know a tweet from a twit – are spending a great deal of money to be able to show huge numbers of “likes”! What part fake likes and dislikes are going to have in the Delhi elections next week and the national elections next year, remains to be seen. It could be quite effective in a city like Delhi where the penetration of social media among the new urban population is high but among whom political awareness is still relatively new. FirstPost: In a new sting operation, Cobrapost has revealed how certain IT companies in India are working to manipulate social media campaigns by buying fake FB likes and followers on Twitter, and running negative campaigns against rivals of their clients and also engaging in creating panic among minority groups. The report states that the most of these companies are working on the behest of BJP and Modi, but also work for Congress sometimes, and in addition manage campaigns for multinational firms, corporations etc as well. ……. In a statement to Firstpost, Facebook said that where fake likes and profiles are concerned, “It’s a violation of our policies to use a fake name or operate under a false identity, and we encourage people to report anyone they think is doing this. Cobrapost: Operation Blue Virus also makes certain stunning revelations. If the claims of the companies exposed are to be believed, among political parties, BJP is at the forefront in social media campaign, so is its Prime Ministerial candidate Narendra Modi, with scores of companies working overtime for him. This puts a question mark on the claims of the BJP leadership that there is a wind blowing in favour of their party and Narendra Modi. The larger-than-life-image that Team Modi has assiduously carved out for Modi over the past one decade may not be that real, rather invented, and is reminiscent of the Goebbellian propaganda, to sway the opinion of gullible public. It is no surprise then that even a milder criticism of the BJP’s star campaigner invites scathing attacks from his followers on social media, claimed to be in millions in count. Paul Joseph Goebbels would have been in his element. Posted in Behaviour, Business, India, Media, Politics | Comments Off on Will buying “likes” on Facebook and Twitter translate into votes? There is bad science and there is silly science and there is trivial science. There is also inane science. A study published today in the journal Nature Climate Change reveals that groups cooperate less for climate change mitigation when the rewards of cooperation lay in the future, especially if they stretch into future generations. “People are often self-interested, so when it comes to investing in a cooperative dilemma like climate change, rewards that benefit our offspring – or even our future self – may not motivate us to act,” says Jennifer Jacquet, a clinical assistant professor at New York University’s Environmental Studies Program, who conducted the research while a postdoctoral fellow working with Math Prof. Christoph Hauert at the University of British Columbia. Researchers at UBC and two Max Planck Institutes in Germany gave study participants 40 Euros each to invest, as a group of six, towards climate change actions. If participants cooperated to pool together 120 Euros for climate change, returns on their investment, in the form of 45 additional Euros each, were promised one day later, seven weeks later, or were invested in planting oak trees, and thus would lead to climate benefits several decades down the road – but not personally to the participants. Although many individuals invested initially in the long-term investment designed to simulate benefits to future generations, none of the groups achieved the target. “We learned from this experiment that even groups gravitate towards instant gratification,” says Hauert, an expert in game theory, the study of strategic decision-making. The authors suggest that international negotiations to mitigate climate change are unlikely to succeed if individual countries’ short-term gains are not taken into consideration. Could there be any form of cooperation – in any field – where long-term gains are not out-weighed by instant gratification? For any investment – let alone a cooperative investment – given a choice of a short payback or a long payback, is there any case where the long payback period is chosen? This is so profound and so deep an insight it almost hurts! The field of behaviour within social psychology has not covered itself with glory in recent times. The cases of Diedrik Stapel and Dirk Smeesters and Marc Hauser are all too recent. But I have the perception that the entire field – globally – has been subject to exaggerations and the actions of narcissists. I had not perceived it as being a particular issue just for the US. But I would not be surprised if the “publish or perish” pressure is stronger in the US than in many other countries. US behavioural researchers have been handed a dubious distinction — they are more likely than their colleagues in other parts of the world to exaggerate findings, according to a study published today. The research highlights the importance of unconscious biases that might affect research integrity, says Brian Martinson, a social scientist at the HealthPartners Institute for Education and Research in Minneapolis, Minnesota, who was not involved with the study. “The take-home here is that the ‘bad guy/good guy’ narrative — the idea that we only need to worry about the monsters out there who are making up data — is naive,” Martinson says. The study, published in Proceedings of the National Academy of Sciences, was conducted by John Ioannidis, a physician at Stanford University in California, and Daniele Fanelli, an evolutionary biologist at the University of Edinburgh, UK. The pair examined 82 meta-analyses in genetics and psychiatry that collectively combined results from 1,174 individual studies. The researchers compared meta-analyses of studies based on non-behavioural parameters, such as physiological measurements, to those based on behavioural parameters, such as progression of dementia or depression. The researchers then determined how well the strength of an observed result or effect reported in a given study agreed with that of the meta-analysis in which the study was included. They found that, worldwide, behavioural studies were more likely than non-behavioural studies to report ‘extreme effects’ — findings that deviated from the overall effects reported by the meta-analyses. And US-based behavioural researchers were more likely than behavioural researchers elsewhere to report extreme effects that deviated in favour of their starting hypotheses. This ‘US effect’ did not occur in non-behavioral research, and studies with both behavioural and non-behavioural components exhibited slightly less of the effect than purely behavioural research. Fanelli and Ioannidis interpret this finding to mean that US researchers are more likely to report strong effects, and that this tendency is more likely to show up in behavioural research, because researchers in these fields have more flexibility to make different methodological choices that produce more diverse results. The study looked at a larger volume of research than has been examined in previous studies on bias in behavioural research, says Brian Nosek, a psychologist at the University of Virginia in Charlottesville. ….. Many biases affect scientific research, causing a waste of resources, posing a threat to human health, and hampering scientific progress. These problems are hypothesized to be worsened by lack of consensus on theories and methods, by selective publication processes, and by career systems too heavily oriented toward productivity, such as those adopted in the United States (US). Here, we extracted 1,174 primary outcomes appearing in 82 meta-analyses published in health-related biological and behavioral research sampled from the Web of Science categories Genetics & Heredity and Psychiatry and measured how individual results deviated from the overall summary effect size within their respective meta-analysis. We found that primary studies whose outcome included behavioral parameters were generally more likely to report extreme effects, and those with a corresponding author based in the US were more likely to deviate in the direction predicted by their experimental hypotheses, particularly when their outcome did not include additional biological parameters. Nonbehavioral studies showed no such “US effect” and were subject mainly to sampling variance and small-study effects, which were stronger for non-US countries. Although this latter finding could be interpreted as a publication bias against non-US authors, the US effect observed in behavioral research is unlikely to be generated by editorial biases. Behavioral studies have lower methodological consensus and higher noise, making US researchers potentially more likely to express an underlying propensity to report strong and significant findings.